The app formerly known as Vigilante isn’t going away. Today at TechCrunch Disrupt SF, the crime tracker now known as Citizen announced that its parent company Sp0n has raised a $12 million Series A round led by Sequoia Capital. Paired with the funding news, Citizen, previously exclusive to New York City, will open its crime-conscious geogates to San Francisco. You may have heard of Citizen. The app was removed from the App Store in its former incarnation for “a violation of Apple’s App Store Review Guidelines, with concerns centered around user safety,” according to a Medium post from the company earlier this year. But earlier this month, a company spokesperson told me that “Vigilante was taken out of the App Store for more technical reasons, dealing with geo restrictions and developer technicalities” and that “the above is rumor and inaccurate,” a statement in apparent direct conflict with the company’s own previous account of the event. At the time, concerns that the app encouraged vigilantism, racial profiling and generally unsafe behavior were voiced by our site and many others. Founder Andrew Frame, co-creator of the VoIP startup Ooma (we’re just going to leave this vintage Valleywag link here) views the backlash as a learning opportunity, though what he learned isn’t entirely clear. The app removed its most controversial features and evolved into what is now known as Citizen, relaunching in March of this year. “The name has changed, but the mission has not,” Frame told me in a call. And yet, the company seems to still feel misunderstood. 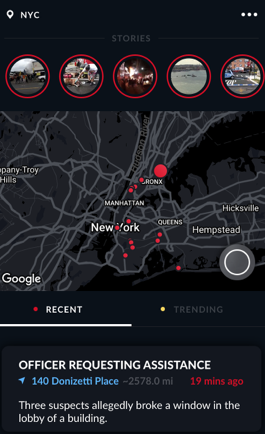 In his vision, Citizen’s alerts create a citizen-powered public safety web to combat the bystander effect — a term popularized by the now-debunked myth surrounding the murder of Kitty Genovese, a cautionary tale that Frame cites as inspiration. Frame admits that the issue is “complicated” and notes how that complexity contributed to the app’s initial controversy. Still, Frame believes that one of the biggest misconceptions about his app is about the kind of information, all drawn from public data, that it pushes over alerts. “There’s a set of policies as to what goes in the app and what doesn’t,” Frame said. The main criteria is that the information needs to pose a public safety concern. Beyond that, certain kinds of incidents are excluded. Frame tells me that Citizen doesn’t report suspicious packages, suspicious persons, domestic abuse or fire alarms, among other things. The kind of things it does report based on my testing experience: a bike theft in progress, a man and woman fighting in front of a McDonald’s, a “man [who] spat on someone on fifth floor” and a “false report of man shot” on St. Marks Place in New York and many, many people wielding knives. Citizen tells me that push alerts that go out over its app are actually screened by an analysis team of 12 humans. Another thing Citizen screens for is officer safety. Frame told me Citizen has had a dialogue with the NYPD for “months” but that the company doesn’t coordinate with police departments in any way. “When you say coordinate, no not really. We don’t really coordinate with them… We have no official relationship.” Frame explained that in conversations the NYPD expressed concerns over the app’s potential to put officers at risk and Citizen now redacts certain information to protect police officers. When I asked if Citizen is just a glorified police blotter, its founder issued a strong defense, seeming to take offense to the question. “Absolutely not, it’s completely different,” Frame said, noting that a blotter does not send a geo-targeted update and explaining that with Citizen, “the relevancy is extremely high.” That’s true, but if you follow a neighborhood crime watch account or a local police scanner anywhere outside of a large city, it does indeed send you a geo-targeted update. Still, Citizen provides these relevant updates without requiring users to hunt these feeds down, so for anyone obsessed with receiving a raw feed of real-time safety notifications in the immediate area for whatever reason, that’s a plus. It’s also a meaningful step toward the vision of a crowdsourced panopticon comprised of everyday crime-fighting citizens that the company imagines in its promo video. After responding to my police blotter question, Frame launched into a series of not-very-well-controlled experiments about how much faster Citizen sends out local alerts than something like a Twitter account. He is very, very into the speed of these alerts, all culled from public data. To his credit, a warning just in the nick of time could, hypothetically save a life, though at this point all of the evidence that Citizen’s impact is net positive and not net negative is from isolated feel-good anecdotes, like Frame’s awed account of a man using Citizen to rescue a baby from a hot car — an incident that I will not recount in detail here beyond saying that Citizen seems happy to celebrate incidents of citizen intervention so long as the outcome is positive. 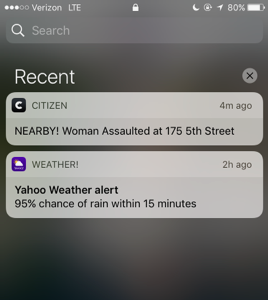 The real difference between Citizen and other services is that Citizen targets these alerts based on their location, and that is meaningful. With regard to the haters, Frame believes that people are jumping to conclusions without seeing how the app affects their lives. For his part, Frame is truly confident that the app is providing a unique and superior service by funneling publicly available data into a geofilter and doling it out again very quickly. He seems pleased at how well the app does what it does without really examining the deeper implications beyond Citizen’s ambiguous stated goals of “safety and awareness.” The company seems unconcerned with the implications of its role in disseminating early crime scene details that might later be incorrect, a dangerous game considering that users might still be inspired to intervene. The company told me that its alerts are more accurate than crime information distributed on other channels, but again this argument was powered by anecdotes. I used the app for a few days, peering into crises unfolding around me in a pre-release version of Citizen for San Francisco. Technically speaking, the app is fast, with a very smooth user interface and a nice clean design. Users can swipe to view trending incidents and live streams pop up live at the top when a user is live on the scene. Some videos stick around afterward in a stories module. If you’re in town for Disrupt, you can see for yourself, as the app launches in San Francisco today on iOS and Android. In that way, in spite of its pivot away from vigilantism, Citizen continues to incentivize its users to head to the scene of the crime (literally) in order to live stream and potentially be rewarded through user interaction — a surprise emoji button that says “whoa” when you click it. Arguably the same could be said for Facebook Live or Periscope or any other live-streaming service, but with Citizen, the geo-located emergency use case is the whole shebang. People who get off on local crime updates on the evening news with probably love Citizen. So will catastrophists, or anyone else interested in what feels like a hastening pace of global disaster. Nextdoor-lovers who thrive in a state of hypervigilance will feel right at home. In a world in which push alerts are the harbinger of world-rending nuclear war, it makes sense that I can get messages about a woman a half mile away being assaulted as I’m getting ready for bed, safe in my hotel room. Is it useful? In many instances, I found it wasn’t. Does it make me feel better? Hell no. But Citizen is right about one thing: Ignoring the horrors unfolding in the world around us won’t work — they’ll just slowly chase us closer and closer to home.